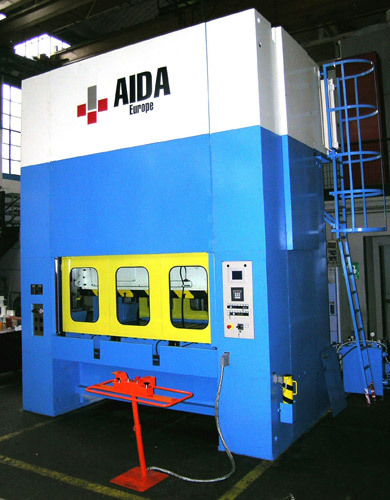 DESIGN - The design of the HERA is the result of detailed examination of every component of the press. All parts are designed and manufactured using modern computer aided systems. The principal parts are verified by Finite Element Analysis (FEA). 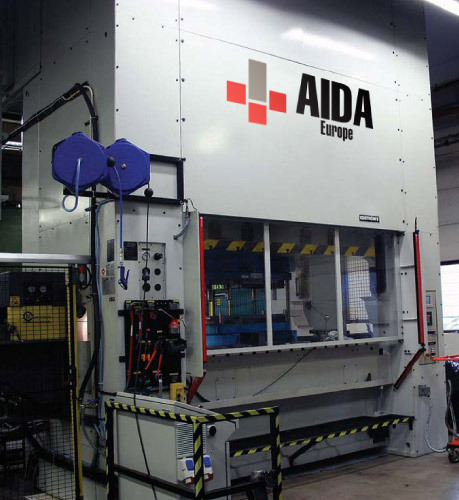 FRAME - All HERA presses are manufactured from a single fabrication of welded and normalized steel; with large end openings. To keep the overall dimensions to the minimum, the hydraulic, lubrication and pneumatic systems are integrated into the Frame. 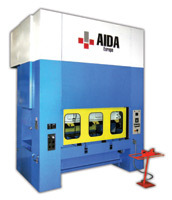 GUARDING - The press is equipped with automatic rising screen guards in the die area. The guarding is according to EC regulations. Upon request, guards can be provided with sound-absorbent materials. DRIVE - The main drive motor is variable speed, controlled by inverter. Other drive motors are available upon request. FLYWHEEL - Air-cooled clutch/brake unit with a low moment of inertia. KINEMATICS - Contra-rotating front to back eccentric shafts are driven by precision helical gears. Adjustable stroke is available as an option. LUBRICATION SYSTEM - A progressive centralized recirculating system is used, fitted with filters, feedback switches and fillup point. SLIDE - The slide is made of welded and normalized steel, with eight point gibs. The gibs can be adjusted in all directions. The adjustment of the slide is by electric motor. OVERLOAD PROTECTION - Adjustable Overload Protection by a hydraulic system. DIE CUSHIONS - Pneumatic die cushions are available as an option; these have a large pad area and are well guided by gibs in the bed. Larger forces can be provided by tandem cylinders. QUICK DIE CHANGE - The HERA can be fitted with die lifters, tool loading arms and hydraulic clamping. ( ) Obtainable dimension with use of additional tables.